snow artists, originally uploaded by jahansell. 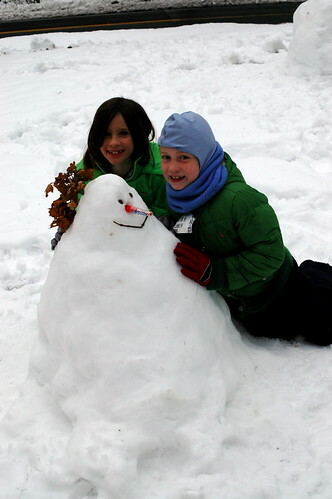 What's a big snowfall without a snowman? This one had a crown of leaves, a marker for a nose, a stick mouth and the eyes ...can't remember - buttons, maybe! The two artists, both seven years old, also made a couch and chair which they lounged in for quite a while. Look like they are enjoying their vacation! Happy new year to you and the snow arists.